Inseyab Consulting & Information Solutions LLC. Copyright © 2016 Inseyab Consulting & Information Solutions LLC. All rights reserved. ForeSight, adopting key principles of Organizational Performance Management, incorporates Strategy Mapping (as per Balanced Scorecard approach by Robert S Kaplan and David P Norton) as a key feature for optimal strategizing and eventual achievement of management objectives. Our optional module of Microsoﬅ Power BI allows you to view Dashboards, detailing enterprise performance, on the go, on devices of your choice. Analysis user can also benefit from the power of Self Service BI. Enabled using PowerView, this feature provides easy to use, drag and drop access to all data marts and models from the underlying datawarehouse. Born out of the need to execute fast and repeatable BI and Analytics projects, Konnectalytics is Inseyab Consulting’s premier product for Oracle Ebusiness Suite applications. Simply put, its a solution that connects to Oracle EBS modules, gets all the data stored in the application, stores it into a warehouse and presents in easy to use, feature rich, insightful analytics Dashboards. With detailed data discovery as well as KPI Business knowledge already learnt and data models already designed, opting for KonnectAlytics over a standard, services-based BI engagement considerably reduces your TCO and significantly improves you ROI. Tested, prebuilt ETL code is available and can be deployed using a choice of Pentaho/Microsoſt SSIS for ETL. Easy to use dashboards, built on state of the art (Microstrategy/Microsoft) technology, provide out-of-the-box analytics on web and mobile platform. This reduces design-to-production time and requires fewer resources to install, configure and run the system. Analysis user can also benefit from the power of Self Service BI. Enabled using Microsoﬅ Power View and SSAS, this feature provides easy to use, drag and drop access to all data marts and models from the data warehouse. Access to raw-data as well as cubes is provided to achieve power-user satisfaction. Catering to the busy executives' over occupied schedule and the need to have insights available on-the-go, option for mobility has been structured into the solution. Be it Android, iOS Windows, your dashboards can be accessed through high quality Microsoﬅ mobile app. Konnectalytics Data Warehouse and OLAP Cubes use industry standard models and design, while utilising KIMBALL Approach, to allow customers to attach additional Oracle EBS sources, as well as, other applications running with the organisation. Its the same full stack approach that would be used in a custom designed solution. We give the administrators and user full power over components at no additional license fee. Konnectalytics relies on layered architecture for ease of use, allowing customers to deploy tools of choice for Data-warehousing, analytics and ETL. Following high level illustration of our solution architecture and components. Data analysis and mining is a sophisticated, organised process capable of identifying key information which the human brain does not see or perceive. Filtering out random factors, it establishes key relations by means of advanced mathematical algorithms, converting all types of data into valid, clearly understandable information which can be directly actioned for greater success. As part of our services, Inseyab offers advisory and consulting services in which we review and understand organizational context and associated data, in order to propose how this data can be analyzed for effective decision making. We also assess data and identify whether the data is complete and usable for mining and analysis. In addition to this, this activity also helps in understanding what type of measures can be discovered utilizing the available data. This exercise helps in giving organization a clear understanding of how the data analysis and mining can help in effective decision making. In addition to the consulting services, we also take customer data and develop meaningful insights using different tools, technologies and models. The tool/technology, approach and models, whether predefined models or AI driven Machine Learning based models, depend on the data and the end objective of the exercise. Best course of action is decided with the customer and implementation is carried out right after that. The service is available on premise or remotely or through cloud services. Both services can be delivered in sequence or as separate activities depending on the customer needs. Technologies such as MicroStrategy, SPSS, Watson, Cloudera, NLP tools, R and other proprietary/open source tools as used based on customer needs. Both on-premise and cloud based options are available. Working on Social Insights in these times of the highly empowered customer is almost the way of normal business for companies the world over – digging for deep insights into customer pains, campaign positivity and overall reaction, brand amplification, passion intensity of followers, churn reasons and the like. All of these prove to be extremely strong in re-adjusting offerings as per the needs of the customer, and drive growth. Our Social Media Analytics practice focuses specifically on bringing together and deriving insights from social media (Facebook, Twitter, Instagram, YouTube, Google+), letting organizations become privy to the conversations and trends in their unique target market and subsequently identify strategies to improve customer engagement and target growth; and respond in a timely way to issues or crises that may impact the organization’s brand or reputation. A critical step in the setup of any social media listening tool is “tuning” gathered information to reduce false positives and irrelevant mentions. Our experience gives us confidence to deliver on value and only fetch information relevant to our clients, helping you get results from a platform tuned more efficiently and effectively to outline specific use cases and topics for analysis. 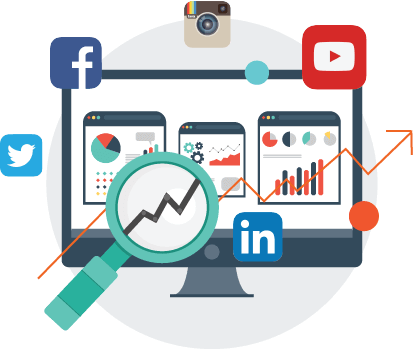 It is imperative to mention that since this service is based around fetching publicly available data, competition social data can be made available to clients as well, hence making it possible to know what your customers like about offers from others, not available in your offerings – such market / customer intelligence can eventually provide you your real competitive edge. This is a Pay as you Grow service with no initial investment from clients – It is us who invests time and our skilled resources to generate detailed reports as desired by you, providing the same at our pre-agreed frequency (usually monthly) at your desk, while you just pay as you go, from your operational expense head. Inseyab's skillset for this domain comprises of industry leading Data Governance and MDM technologies, including, but not limited to, IBM, Microsoft and Oracle tools. 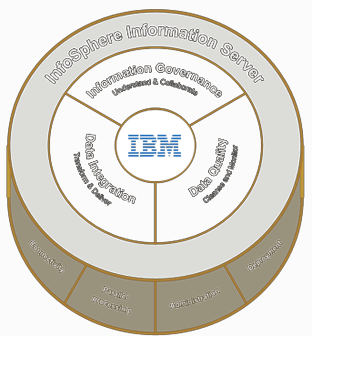 We offer services under the able assistance of these Gartner's Magic Quadrant Leaders - utilizing tools including InfoSphere Information Server for Enterprise from IBM, Master Data Management (MDM) Hub Architecture from Microsoft, Data Relationship Management (DRM) and Data Relationship Governance (DRG) from Oracle. With the explosion of data volume, velocity, viscosity and veracity, it is of utmost importance for organizations of today to effectively monitor where their data says they are headed. In the wake of even more strict regulatory as well as stakeholders’ pressure, the need for this monitoring and management is of even greater significance. In the same vein, it has been observed that almost all large organizations, especially Telecom Operators and Financial Services Institutions (FSI) have, of late, given significant attention to improving their ability to manage data practice across all business domains for maintaining confidence based decisions - clients acknowledge the need to address broader underlying IT investment to better drive information management actions across their organizations. In this services stream, Inseyab caters to this requirement of Data Governance. By developing an effective “Data Governance Program” for managing Information and Data, organizations can manage demand, deliver value, and mitigate risk of depending on low quality data. A robust “Data Governance Framework” helps to establish equilibrium between rigor and responsiveness on an ongoing basis. 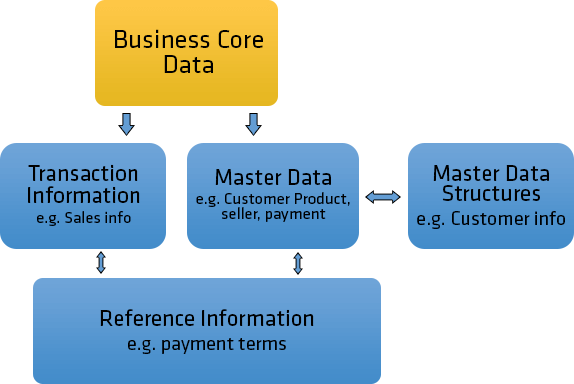 Master data is a set of core data elements—with their associated hierarchies, attributes, properties, and dimensions—such as customer, product, legal entity, chart of accounts, employee, vendor, market channel, geographic location, etc., that span the enterprise IT systems and drive the business. Effective MDM facilitates quality information by establishing a mechanism for shared internal information controls: business units have autonomy over the information they use, but IT has ultimate oversight and control of corporate information. Auditability is another by-product of effective MDM. Effectively standardizing and managing master data, gives a company the ability to track the change history of corporate information, as well as the ability to roll back to a prior state in the event of a systems failure or for comparing prior states with current or proposed future states. Data Governance and Management is a journey, not a destination. 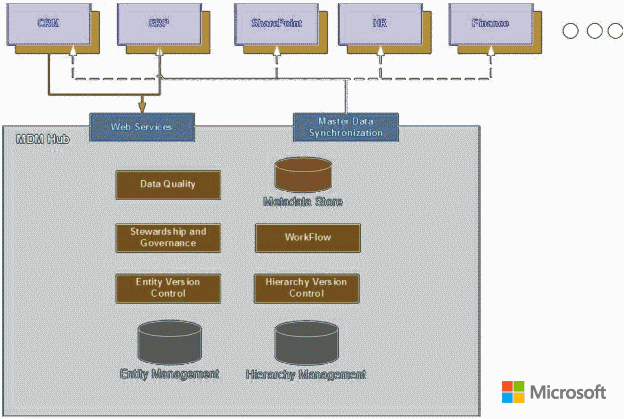 Management and improvement of enterprise master data is an ongoing, often complex, process. Inseyab helps companies by outlining and enforcing a well- defined, time-tested course for Data Governance and MDM implementation. This increases an organization’s chances of a smoother journey and their chances of achieving their efficiency, effectiveness, and flexibility goals will be greatly improved. The Inseyab DDM Data Governance & MDM Framework outlines a few process drivers for starting and sustaining a Governance and MDM journey. These process drivers will not necessarily mark progress chronologically; instead, they will help determine that progress is being made correctly and that the company’s maturity level in understanding the importance of master data is increasing. In addition to conventional data stored with organizations transitional system, there is tremendous amount of data being generated from Big Data sources. As part of our services, our team will work to help you bring order to your Big Data. With proven expertise in mature technologies and thought leadership in those that are emerging, our team of senior-level consultants will help you implement the technologies you need to manage and understand your data - allowing you to predict customer demand and make better decisions faster than ever before. Whatever your Big Data challenges are, we'll provide you the strategic guidance you need to succeed. 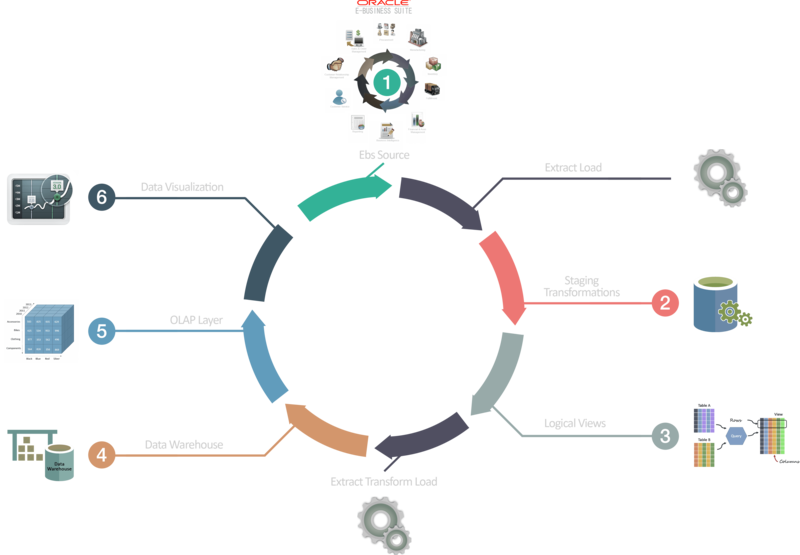 Data Ingestion including structured, unstructured and semi-structured datasets for batch and real-time loads. In terms of tools and technologies, our consultants have expertise in Cloudera, Hive, Informatica, SAS, R, Hadoop, Spark, Scale, MapReduce, Perl, QuerySurge, Pentaho, Talend, Mongo DB, MicroStrategy, Microsoft, Oracle, IBM and other related tools and technologies. We deliver end to end Big Data implementation or can engage in building Big Data Roadmaps for our customers. BI, as a discipline, is made up of several related activities, including data mining, online analytical processing, querying and reporting. In order to build capacity, initial groundwork must be laid out and an assessment must be carried out before aiming to implement a unified enterprise-wide Business Intelligence platform. A roadmap for successful Business Intelligence can be implemented following an initial assessment. A successful BI strategy is not simply the sum of various projects and independent efforts, but instead reflects a comprehensive network of people, processes, and Technology aligned to deliver value. BI assesment and roadmap development will aim to carry out an assessment of business requirements, processes, end-user types, scenarios and interactions, including technical and functional specifications for BI capacity. Using its proprietary AID™ (Assisted Information Discovery) framework, Inseyab will aim to discover, understand, harmonize and verify the complete data landscape. By determining where an organisation stands in relation to Key BI readiness factors, it can leverage strengths, manage the risks, launch initiatives to improve readiness, develop competencies, and optimize data management processes. A BI Readiness Assessment can thus be seen as a BI strategy tool and as an implementation tool that, with modest investment of effort, can greatly enhance the probability of a strong payoff for a BI investment. A BI Roadmap is the second step in developing the comprehensive BI Strategy. 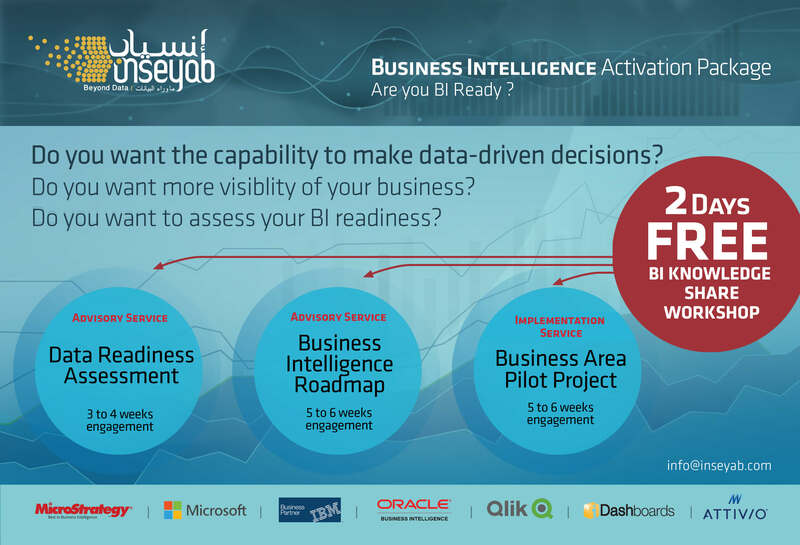 Inseyab uses a holistic framework for assessing the readiness of a BI program and to deliver a roadmap. Using its proprietary AID™ (Assisted Information Discovery) framework, Inseyab will aim to discover, understand, harmonize and verify the complete data landscape. improve the chances before The BI assessment will aim to establish a cohesive, evolutionary vision for current and future development. As an outcome of this exercise the customer will have a clear understanding of which technology might be aligned with their BI needs, which systems should be BI enabled during initial phases and which one should be kept for later stages, which prerequisites should be in place before embarking on BI journey and how will the users be trained for BI based organization. Our services for Business Intelligence revolve around Inseyab's objective of serving customers make more informed, data driven decisions. We strive to complement customers' experience and decision making capabilities with Insights from their data to significantly improve organizational efficiency and positively impact their bottom line. Business Intelilgence is all about visually appealing, information revealing infographics, brought forth after pulling in revelant data from underneath systems scattered across an enterprise. Applying Business Domain knowledge via our Subject Matter Experts (SMEs) for the verticals we operate in, our engagement starts with a mutual agreement with client executives around what KPIs are required in the shape of infographics. Data for these KPIs is extracted through ETL scripted by our Data Management resources, and pulled onto the Data Models designed by our Architects. Whether we utilize MicroStrategy, Qlik, IBM Cognos or Microsoft BI as the visualization tools, we have the choice between pulling in data directly into the Data Layer of these tools and present the information onto dashboards, or connecting it to an interim DW. If we go through the DW route, we have a choice between adopting a top-down approach of Bill Inmon's DW or bottom-up approach of Ralph Kimball - we prefer the latter, essentially since it allows us to have short, milestone based releases for the comfort of our clients and go by a datamart by datamart approach (connected through common conformed dimensions) towards an enterprise wide DW, eventually. Skilled across various other tools for extracting data, Informatica and SSIS are our ETL tools of choice, whereby data is extracted, transformed to the requirements of the interim model and loaded into the DW (via staging). Our sole purpose being helping convert Data to valuable Business Insights, we take our customers from basic description of data to prediction of where they are headed, and eventually prescribing what should be done for even better results. It is pertinent to mention that Analytics in general, and Business Intelligence in particular, are journeys for the clients - programs rather than projects we help our customers embark upon and target to postively impact the bottom line. Performatrix is a secure web-based product for tracking and developing employee’s performance. It automates employee’s life cycle with an organization from recruitment, team management, task management and performance tracking to employee’s training and development and eventually exit management. Multiple user roles and approval workflows with notifications and alerts enable users to perform essential management functions in a few clicks. 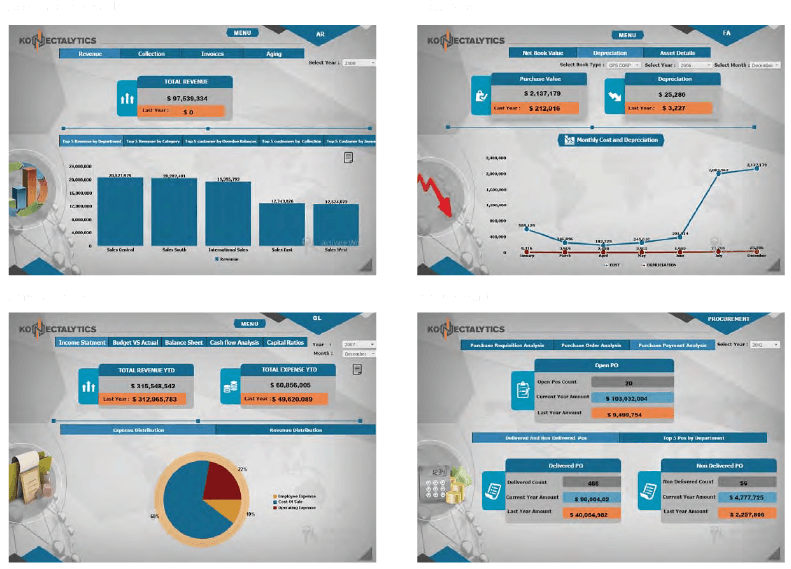 Coupled with detailed reports related to each function, it also has intuitive dashboards for executive users with drill downs and slice / dice options across regions and departments. Using performatrix organizations can easily create trainings, deliver them and evaluate performance of dispersed workforce through online quizzes. Developed in .Net, the solution is based on component based model. Making the solution extendable and scalable. Benefiting businesses to improve their knowledge sharing, bringing transparency to performance and reducing costs incurred on functions like recruitment, training & development and performance management. Automation of such functions throughout the organizational hierarchy enhances employee participation resulting in more efficiency and lasting motivation. 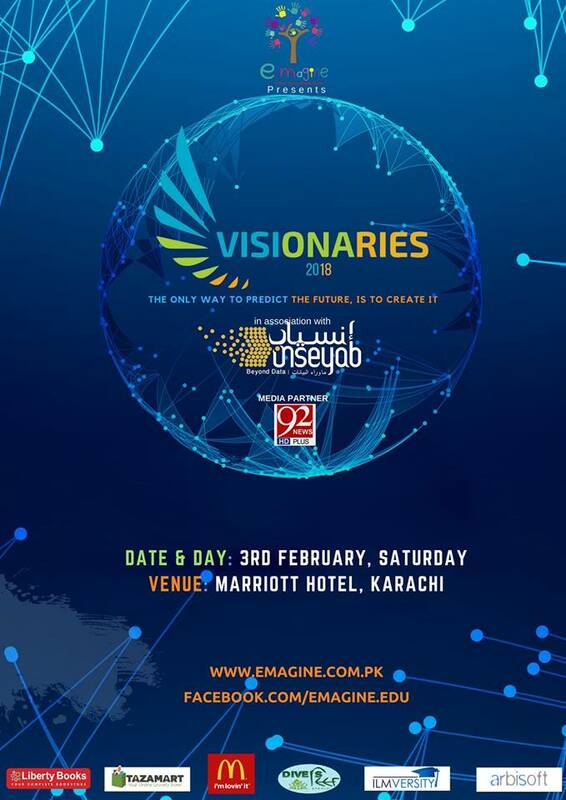 Inseyab proudly announces it's collaboration with eMagine for VISIONARIES 2018. A unique platform that gives an opportunity to next generation visionaries to present their dream and set a vision for life. Business Intelligence Consultant responsibility is to help businesses and organizations gain a competitive advantage by implementing information management and analytics solutions which provide the clients with business insights which enable them to optimize their operational performance. To Provide expertise in design, development and implementation of Business Intelligence (BI) and analytics systems. Work with technical resources to design and model the data warehouse systems. Assist in developing BI reporting and analysis applications. Provide optimal and cost-effective solutions to business teams in achieving business objectives. Provide functional and technical guidance to business teams when needed. Conduct business meetings with customers to determine project requirements and milestones. Assist Project Managers in developing project plan including budgets, timelines and forecast. Compare operational progress against planned project objectives and suggest corrective actions for variances. Review the project information to identify the risks and opportunities and present it to the key leaders. Analyze the business performance and develop reports on performance metrics. Develop knowledge on business intelligence skills and processes. Develop best practices to achieve project objectives and deliverable. Develop positive working relationship with customers and other department staffs. Stay updated with ongoing business developments and latest market trends. Create a repository of the BI research results and findings. A bachelor's degree in business, management, accounting, economics, statistics, information science or similar. Need complex computer programs to mine data sources and look for trends. Excellent Communication Skills to communicate the data findings to the company or their managers. Problem-Solving skills to look at the data trends and recommend solutions for creating more revenue and reducing loss. Time Management skills to work on large projects and many data streams and many deadlines. UI/UX Designer helps to create and enhance digital interfaces like websites, apps, and software programs to make the experience more effortless and enjoyable for consumers. Their work helps boost customer satisfaction, build brand loyalty, and ensure that there aren’t any design elements present that might prevent potential customers. Sketch out visual concepts both on paper and using software applications. Work on editing/designing collateral including dashboards, brochures, solution pagers, profiles etc. Re-design websites to make them more responsive, for example, you could be involved with those aimed at the general public from both government and commercial service industries. Re-design or create mobile apps that are easy to use and are configured appropriately for smartphones and tablets. The ideal applicant will possess strong knowledge of the BI Tools, including concepts of report/dashboard development. The successful candidate will be responsible for contributing to data analysis, data modelling, report/dashboard development, POC development and conducting research on recent development techniques on the BI tool. Those looking to gain valuable BI experience with an established organization are encouraged to apply. The ideal applicant will possess strong knowledge of web interface development, including concepts of digital interfaces like websites, apps, and software programs to make the experience more effortless and enjoyable for consumers. The successful candidate will be responsible for contributing to sketch visual concepts, editing and designing marketing collateral, designing/re-designing websites, designing app/dashboard interfaces and enhancing visual appeal. Those looking to gain valuable UI/UX experience with an established organization are encouraged to apply. Only PDF, DOCX and DOC files attachments are allowed. Your details have been submitted successfully. We will get back to you shortly.